May 27th is in Guadeloupe the Slavery Abolitions commemoration Day. On this occasion, the municipality of Sainte-Anne proposed a creation residency to François Piquet, who presented a project associating the Reparation process with his will to put the art in the reach of all the public. Every July, Sainte-Anne offers a festival of Gwoka, Guadeloupe drum music, directly resulting from slavery. The Gwoka dance relies on the concept of "bigidi" (imbalance and movement) theorized by the choreographer Lena Blou. The artistic proposal is based on the resonance of the "bigidi" with the theme of Reparations. The artist led workshops with about 250 children (aged 6 to 11) from four schools in the city: R.G. Mathurine de Deshauteurs school, Victor Vallier des Grands-Fonds, Mixte 2 Ginette Maragnès and Florent Donnat de Saint-Protais. After discussing the history of slavery, and relating the notions of imbalance and reparation, the students made drawings of characters in imbalance, in bigidi, on a page of the reparation request form designed by the artist. Some of their work has been reproduced to be pasted in large format on the walls of Sainte-Anne (Guadeloupe). View of the exhibition in Sainte-Anne streets. View of the exhibition at the Town Hall of Sainte-Anne : original paintings on a page of the reparation request form. - What is the day of May 27th? - How to link the imbalance (bigidi) and the reparation request form. The artist shows some possible "bigidis", putting himself in a situation of imbalance in front of the class. A few volunteer pupils, each in turn, put themselves in imbalance, while the artist makes very quick sketches of their pose on the board. Using very fast drawings, he shows different graphic possibilities, including how to move from a "stick" character to a more detailed version (add "muscles" on the "skeleton", look at the drawing to better see his improvement). The students make several sketches in succession on a large sheet, to change their design. Prohibition to erase. the goal is to draw a person who is about to fall. But that will not necessarily fall. During the time of the drawing, the artist passes from kid to kid to help, unlock, propose things, and show other students the work in progress. We then move on to the final realization of the black gouache on a page of the Reparation form. - it is not only black people who have been enslaved. White people too were taken as slaves. - all black people were not enslaved, all white people did not have slaves. - Slavery did not begin in Africa, there was slavery everywhere. - the Europeans started taking slaves to make sugar at the end of the Middle Ages. To earn money. Profit was the reason for slavery. - Triangular trade and the slave trade have been the largest human beings traffick in the world history. - slavery is the greatest possible crime, it is a crime against humanity. - people were forced to work, they were tortured, they could not have anything, even no family. - enslaved people did not want to remain slaves. They revolted. - Haiti was the first country to free itself from slavery. But it had to pay a lot for it, for a very long time. - slavery created an economic imbalance: Europeans became very rich, Africans and enslaved people very poor. These imbalances still exist today. - Reparations serve to repair these imbalances, to restore justice. 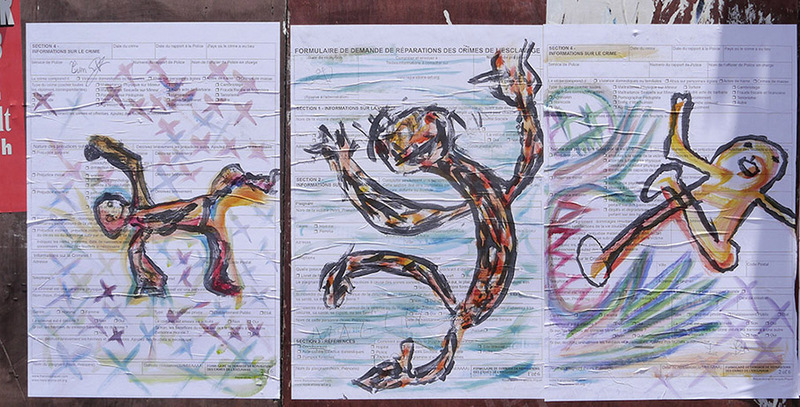 Views of the 90x60 cm posters made from the children drawings and pasted in Sainte-Anne streets. Large outdoor sculptures and a residency rendering exhibition in the Town Hall of Sainte-Anne complete this process. 120x90 cm artist painting pasted in Sainte-Anne streets. Event poster. Taille directe sur Acajou amer. 280 x 90 x 80 cm. Taille directe sur fromager, éléments mécaniques de Darboussier, résine. The iron blades used to draw these two columns ("colonnes" in french) come from the former sugar factory Darboussier, now Memorial ACTe site. The weaving of these fragments of the history of the place, symbols of a larger history still under construction, is part of the Reparation process, creating dialogue, semantic bridges, points of rebirth and recognition between parallel representations of a shared history. This diptych formalizes parallel constructions of the national myth, including identitary, historical and memorial narratives of societies that were build on slave trade and colonization. Depending on whether we look at them from the past, or from the future, these two sculptures are erected to a collective utopia or in an overwhelming and deadly dehumanization.